They lied and they got away with it and that’s outrageous – since the referendum this sentiment has prompted hundreds of thousands of words of commentary, and rightly so. A crisis so grave and unexpected inevitably makes us suspect some underlying, fundamental shift that we must hurry to comprehend, and so ideas that were not previously at the centre of our thinking have arrived there, with a bang. We ask ourselves whether we have entered a post-factual society dominated by emotion, whether social media are killing the truth, whether society is fracturing in ways that traditional political discourse can’t express. In the excitement and confusion, however, it is worth reminding ourselves how much of what we have experienced is not new. If we do that, then at the very least we should have a clearer picture of what has really changed, which in turn might help us to respond better. Who lied? Politicians for one. There is nothing new about that. The press for another: the right-wing dailies and Sundays that dominate the national newspaper market lied again and again, and no one could say there was anything new in that. Anyone else? A good case is made that news broadcasters assisted the liars by presenting lies and truth on an equal footing in the name of ‘balance’, but this too is hardly a new problem: look at the history of climate change reporting. And whatever they may have done wrong, the broadcasters can’t reasonably be accused of deliberately lying to the public. Then there are the social media, the algorithmed, bitesized bubble-world in which many if not most of us now experience news. That is certainly new, although it is easy to exaggerate how new – many people in their twenties today can’t remember life without social media while few in their thirties can have much recollection of life before the internet. That’s a lot of people. The distorting effects of internet and social media activity may well have influenced the referendum outcome and they definitely need close study and debate. But we don’t yet have evidence that they played a decisive or even a significant role. And we can say with confidence that the lies which appear to have made a difference – and the emotions to go with them – did not originate on Facebook, on Twitter or in blogs, though no doubt those media provided an echo-chamber for them. And despite persistent claims that in some post-modern way ‘facts don’t work’ in politics any more, the referendum experience does not begin to prove that, for this important reason: fact-testing was not allowed to function properly in the campaign. Yes, there were debates and confrontations in which remainers challenged leavers and vice versa, and yes there were online fact-checkers at work, from Full Fact and other dedicated and serious bodies, but none of this was able to shake, discredit or erase the lies. We need to confront this: the forces that generated and defended the lies were not new but old. Those lies were crafted by politicians and the right-wing press, and above all it was the power of right-wing newspapers, notably the Mail and the Sun but also the Express and the Telegraph, that ensured that lies could not be effectively exposed for what they were. Far-fetched? Paranoid? Not in the least. The enterprise began decades ago, when these papers adopted the EU as a scapegoat. Anything that could be blamed on a supposedly overweening, top-heavy, mad and unaccountable Brussels bureaucracy was blamed on it, and from the 1980s onwards fictions were created about its decisions. Thus they created the climate. Once the referendum became a real possibility they proceeded to whip up the storm, confecting new lies of their own and propagating those of others for all they were worth. Getting away with this was easy because, despite the Leveson Report and the will of parliament, when it comes to ethics and accuracy the national press remains free to mark its own homework, answerable only to a complaints body (‘IPSO’) entirely of its own design. IPSO is the discredited Press Complaints Commission with new window-dressing: even if it wanted to raise standards of accuracy in reporting it does not have the power. Thanks to IPSO, therefore, these papers lied to their millions of readers every day with complete impunity, and it is hardly surprising that the lies steadily grew bigger and more brazen. But surely, you might think, there were truthful journalists capable of challenging the lies in other publications, online and on screen. Surely in the internet age every liar can be called out. This is a misconception. Truthful journalists exist, and there are papers such as the Financial Times and the Guardian which have a serious commitment to accuracy, but they have nothing like the reach or power of the Sun and the Mail. 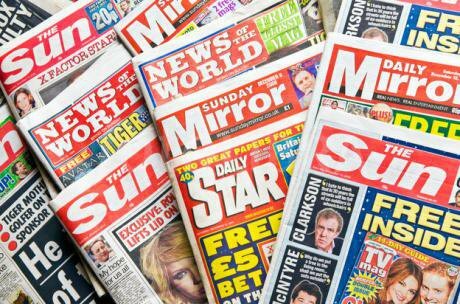 As for the Mirror, which opposed Brexit, it may still have a daily sale of almost a million but in comparison with the two market leaders it is poor, understaffed, muddled and unimaginative. And just as they dominate the newsstands, the Mail and the Sun – prodded along by the ever more reckless Express – are able to set the agenda for broadcast news. If the Mail goes big on anything, and it does that every day, the editors in the television and radio news studios rarely have the nerve to ignore that claim or that subject, no matter how crazy it might be. And thanks to the legal obligation to provide balance the views of the Mail and the Sun, however blatantly dishonest, are almost always at least half the picture. Meanwhile, of course, in their own pages these papers almost never present a balanced view. On the contrary, they blot out the opinions and activities of their adversaries so far as they can, and on those occasions when they have no choice but to engage (perhaps because those adversaries have managed to make their point on television) they resort to the personal, to mockery, to mudslinging and to more lies. This is the power of the megaphone. This is how the truth gets lost, and how those who seek to test facts on behalf of the public are drowned out, marginalised and hamstrung. At the same time, the arguments are vigorously infused with emotions, so that reason is pushed to the margin. Neither Twitter nor Donald Trump invented this; newspapers have been piping outrage, fury and contempt into our homes and lives for decades. Paul Dacre, the editor of the Mail, doesn’t talk about informing his readers, he talks about making them laugh, making them cry and most of all making them angry. These were the forces at work in the referendum and very little about them was new. Most of the same things happened in the 2015 election, and look at the result then. They also happened, to give another recent example, in the response of these and some other newspapers to the gravest crisis they have experienced in decades: the phone hacking scandal and the Leveson Inquiry. Their campaign of lies and thuggery in relation to that inquiry, combined with their power over a mystifyingly compliant David Cameron, ensured that even though parliament approved reforms to press regulation, and even though public opinion was overwhelmingly behind the changes, nothing happened. A little further back, similar methods were used in the press assault on the family of Madeleine McCann. This is not to suggest that the referendum outcome was exclusively the work of Paul Dacre, Rupert Murdoch and their ilk. Other people and other factors, including factors wholly unrelated to the EU, played their parts. Farage, Johnson and Gove, for example, were capable of contriving evasions and distractions of their own, while the Remain campaign was, to say the least, unsophisticated and lacklustre. But this much is surely clear: the Leave victory, which relied so heavily on falsehood, would not have been possible without the full-blooded commitment of the right-wing press. This means that, while it is right to scrutinise other, newer factors that may have been at work, it would be a mistake to lose sight of the vital role of editors and proprietors. If that sounds high-minded, then consider this. As a society, we choose to subsidise our newspapers every year to the tune of hundreds of millions of pounds by zero-rating them for VAT, and we do that on the grounds that those newspapers are essential to us because they provide the information we need as citizens if we are to make democratic decisions. Now ask yourself: are the Sun, the Mail and the Express performing that role? Finally, this is not just about the past. It is also about the future. If you imagine that one day a couple of years hence it will be possible to have a reasoned national argument about whether the terms of Brexit are good for Britain or ruinous, then think again. Unless something changes, exactly the same storm of falsehood will engulf that discussion as did the referendum. Equally, if you believe that five or ten years from now it might be possible to reach some reasoned national view about whether Britain has gained or lost by Brexit you are kidding yourself. The Mail and the Sun – they may not exist as print papers but there is every reason to assume they will still enjoy great power – will do all they can to prevent a rational, fact-based public assessment. This is a bleak prospect, but change is possible and it can begin now. We came close in the aftermath of Leveson, and the structures have all been created. When David Cameron lost his nerve, however, or had his lead jerked by the editors and proprietors, he failed to deliver the sticks and the carrots needed to make the system work. A stroke of a pen, quite literally, is all that is needed now to initiate the process of protecting the British public from press abuse while at the same time painstakingly safeguarding freedom of expression. It can be done, if the government will do it. Perhaps together we could shame it into doing so.